David started work as a veterinary nurse student at Lynwood veterinary centre in 2005, qualifying in 2007. 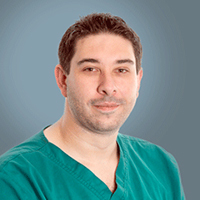 After spending some time locuming, David worked at the Royal Veterinary College's Queen Mother Hospital for 3 years as a surgical and anaesthesia nurse. In 2010 David moved to Devon to work as head nurse at a mixed practice, before moving back to Dorset and joining the SCVS team as a surgical nurse. David has a passion for anaesthesia especially regional anaesthesia and pain management, and has completed the ESVPS certificate in anaesthesia and critical care certificate. He has recently started the North American veterinary technician specialist in anaesthesia course.